Neighborhood security cameras are becoming the norm in many communities around the United States. The increase in neighborhood security camera systems is due to many factors. The neighborhood security cameras overall success for crime prevention and apprehension can not be denied. Having one security guard sitting in a small guard house with predictable hours and routines is easily circumvented. Even the most novice thieves can detect the patterns of a shift change or when the security guard will hop in his car to do a few laps around the neighborhood. Neighborhood Security Cameras cast a much wider net than one set of eyes that is stationary for the majority of the day. Neighborhood security camera systems can be viewed by as many persons as you would like to grant access to them. Many communities have a large group of persons involved within the neighborhood watch program. Although not everyone appreciates a busy body as they can be meddlesome the majority of the time. Due to the snoopy nature of busybodies they tend to know the regular comings and goings of the neighborhood better than most. Imagine when you come home and your house has been emptied of all its valuables. You will be wishing for a busy body neighbor and could have greatly benefited by a so called interfering neighbor. Another reason for the increase in neighborhood security cameras and hoa security camera systems is that they are unbelievably affordable. Having security guards for three different eight hour shifts can easily approach ninety thousand dollars a year. One guard shack location with three different guards each day to cover all 24 hours is the bare minimum for coverage. Many communities have opted away from physical guards and have started supplementing them with neighborhood surveillance cameras. Many gated communities will always have traditional security guards but to decrease cost digital guards are the newest type of security measure that has proven effective. Remote video monitoring thru your neighborhood security cameras. This is the same principle as having members of neighborhood watch program remotely monitoring the security cameras. Digital Security Guard developed and was an innovator of live video monitoring technology with licensed security guards. Having neighborhood watch cameras is gaining more popularity because criminal acts involving home invasion and burglary has skyrocketed in recent years. Disturbing crime trends have been shown to growing every year around the suburbs at an alarming rate. The modus operandi of vigilant neighborhoods and communities has included adding newer layers of security through neighborhood video surveillance. It has proven that being mindful and attentive is the most proactive measure recommended by law enforcement. Neighborhood watch programs were initially spearheaded by local police agencies. Neighborhood watch programs have always been around but lately they are gaining more momentum than a Mississippi steamboat. If your neighborhood or gated community is interested in getting neighborhood security cameras consult TechPro Security Products. Our security surveillance experts will design the perfect solution for your neighborhood or gated community FREE of charge. 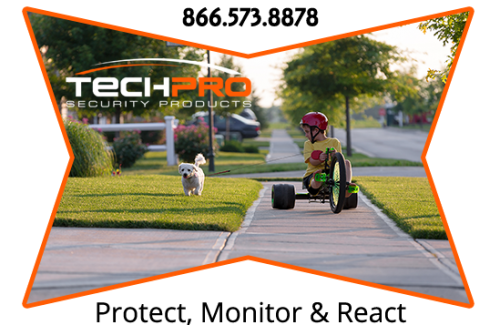 TechPro Security Products bundles many COMPLIMENTARY services into their neighborhood security camera systems. Our team of security surveillance experts is comprised of seasoned industry professionals. Law Enforcement and Military backgrounds with security surveillance specialists who helped pioneer the use of remote viewing in the US via smart devices with apps. Our technical support specialist are on hand 9am to 8pm EST to help for the lifetime of your security surveillance products. Need help viewing the cameras from any myriad of smart devices – No problem. You might want to configure certain security cameras to be activated by motion after certain hours. Security Cameras placed at pool houses, community centers and other areas that should not have visitors after certain hours can be setup to be activated by motion. Alerts can be triggered to notify you with emails or text alerts when any type of vehicle pulls up to a gated entrance. There are many options where we can custom tailor a complete security solution for your neighborhood or gated community. Call TechPro Security Products if you have any questions surrounding neighborhood security camera systems. Related Blog Articles: neighborhood security cameras, hoa security cameras, gated community security systems, neighborhood security cameras, neighborhood surveillance cameras, neighborhood security camera systems, neighborhood video surveillance, neighborhood watch cameras, neighborhood camera system.